"41AN34 - 5, Burial D-1" by Timothy K. Perttula and Robert Z. Selden Jr.
DECORATION (INCLUDING MOTIF AND ELEMENTS WHEN APPARENT): The rim is divided into four rectangular panels by brackets with upper and lower cross-hatched engraved triangles. Within the panels are curvilinear hooked arm elements comprised of upper and lower sets of three engraved lines, as well as opposed sets of three closely-spaced curvilinear engraved lines. The vessel body has overlapping brushing marks on it. Poynor Engraved, var. 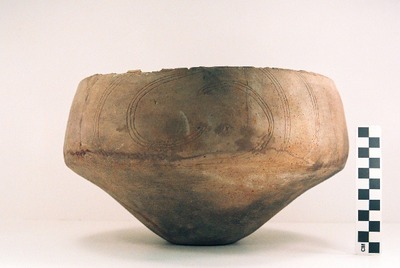 N carinated bowl from the Pierce Freeman site.